The attempts to mask inflation are reaching truly ludicrous proportions. Housing rents… which the CPI claims are falling. 1) Apartment rents rose in 89% of US cities in January. 2) Rents as a percentage of income are at their highest levels ever. 3) The supposed “drop” in rents actually consisted of rents rising 2.7% Year over Year. The fact that it was the slowest rise in years is somehow supposed to mean rents fell. At some point, someone needs to point out the obvious: that the entire reason the Fed uses CPI as an inflation measure is to HIDE, not accurately portray inflation. 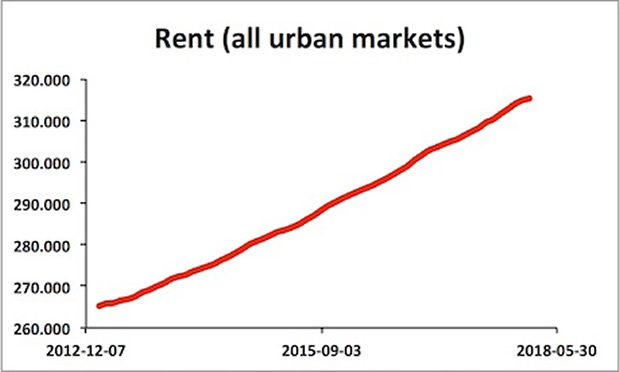 Here’s a chart of Rents for all Urban Markets in the US. If you believe that the trend is DOWN here I have a bridge to sell you. The fact is that the Fed is desperately “massaging” the data to hide the reality that the inflation genie is out of the bottle. 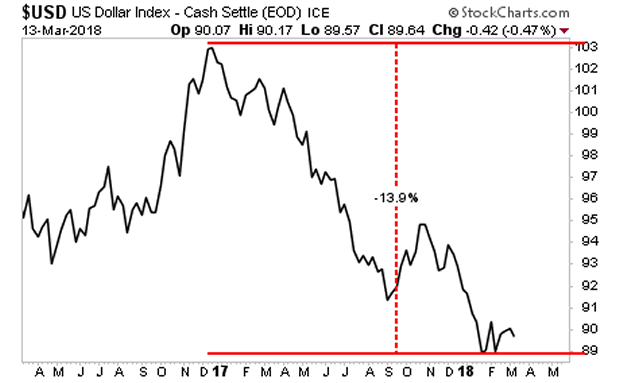 The $USD has already figured this out, which is why it has been dropping like a brick, falling nearly 14% over the last 15 months. Who are you going to believe? The $USD or Fed economic forecasts? Unfortunately, this trend also spells DOOM for the Bond Bubble. Bond yields trade based on inflation. So if inflation is rising, bond yields will do the same. When bond price fall, the Bond Bubble begins to burst. On that note, bond yields are spiking around to globe to accommodate higher inflation. 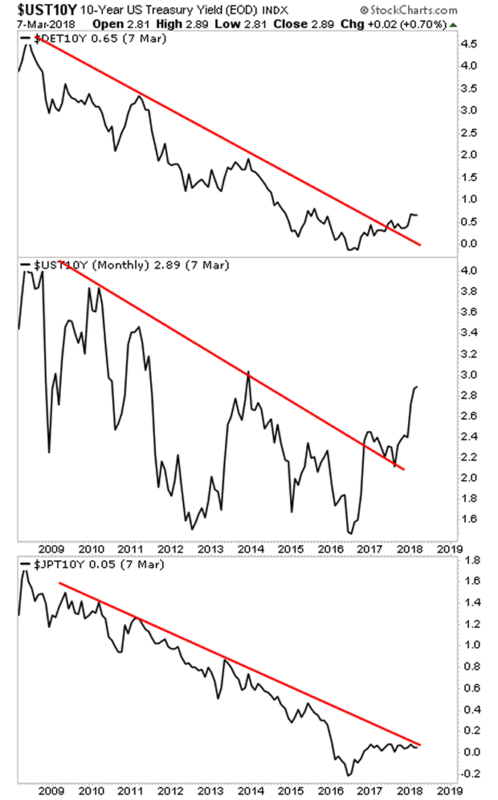 Already we are seeing yields on US Treasuries, German Bunds, and even Japanese Government Bonds spike higher to test if not BREAK their long-term downward trendlines. This is a truly global problem for global Central Banks which are all WAY behind the curve. And this is going to present investors with one of the great money-making opportunities of 2018 if they’re positioned correctly.